Tanjore Maharastrians enjoy this recipe as “Mandi Sambar Bath”! 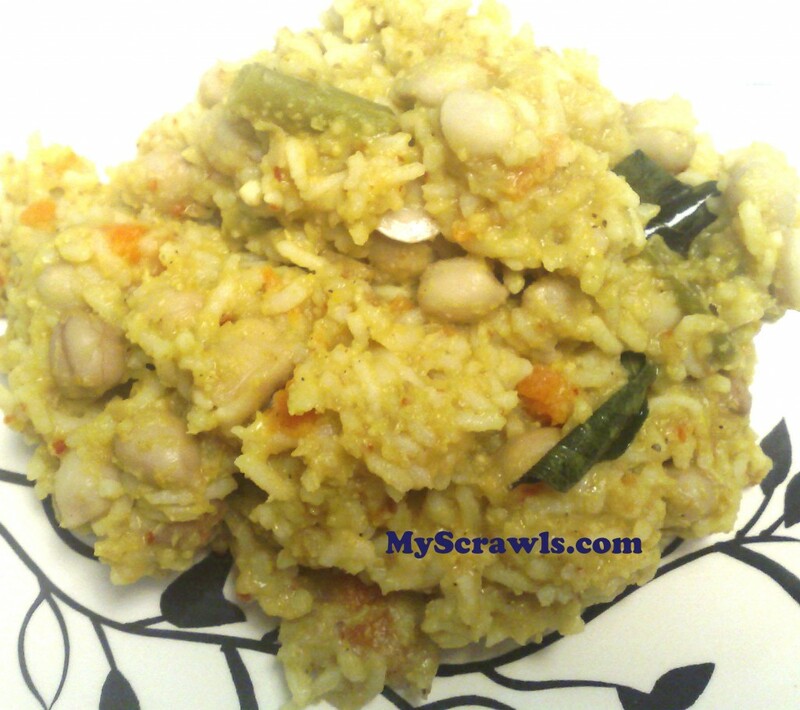 Cook dal with peanuts, rice and veggies separately. Heat 1 tsp of oil and roast urad dal, channa dal, dhaniya, red chilies, asafetida and methi. Add the grated copra and remove from the stove top. Allow it to cool and then grind it in a mixer. Add salt and turmeric powder to the tamarind extract. Add the bisi bele powder and 1/2 cup of water to the boiling mixture. Allow it to cook for 2-3 mins. Now add the cooked dal + peanuts, rice and veggies and mix them thoroughly. Heat 1 tsp of oil (this one preferably gingely oil). Add the hot oil and curry leaves. That is delectable. A one pot meal with lentils n veggies. Loved your version!I am an Andhrite and so this was new to me till i experimented with a recipe in hand one fine day. THANKS A LOT FOR THE CORRECT PRONOUNCIATION OF BISI BELE BATH. MANY A TIMES UPON HEARING OR READING THE NAME ‘BISI BELA BATH ‘ WOULD PUT ME OFF LOOKING AT THE DISH LET ALONE TASTE IT.